Embraced by a network of Interstate highways, Morgan County is less than 100 miles from Washington, D. C. and Baltimore, the financial and technological centers of the Mid-Atlantic. Federal government operations abound in the area. Philadelphia, Pittsburgh and Richmond, Virginia, are within 200 miles, and New York City is just 266 miles away. 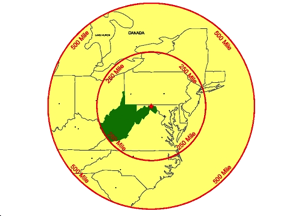 The Eastern West Virginia Regional Airport, its 7,000-foot main runway and 5,000-foot cross runway capable of handling the world's largest airplanes, is just 26 miles away in Martinsburg. Cumberland (Md.) Airport, with commercial service to Pittsburgh, is 25 miles distant. The Washington County (Md.) Regional Airport, with commercial service to Baltimore and Pittsburgh, is 47 miles northeast of Morgan County. Potomac Airpark, a regional private airstrip just 3 miles north of Berkeley Springs is open to small jets and planes. Morgan County and its Business Park are ringed by Interstate 70, 81 and 68. Major trucking companies ply these highways, as well as U. S. Route 522, a major north-south artery that borders the Business Park. CSX Transportation and Amtrak service nearby Martinsburg, WV and Cumberland, Md.